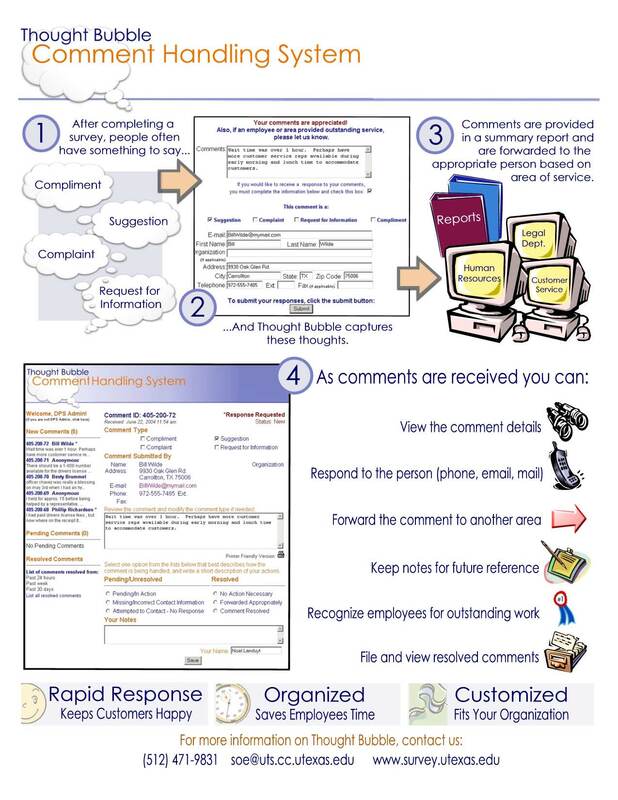 The Thought Bubble Comment Handling System is a survey data and comment collection tool that allows agencies and institutions to collect, report and track both quantitative and qualitative data. The System is used by all sizes and types of agencies and institutions and has a number of administrative and reporting tools as well as special features. It allows ease-of-use for both survey respondents and agency staff, providing timely and organized feedback. Running reports and queries is quick and easy and provides real-time analysis of comment handling and comparisons across departments. The System was custom-designed for use with the IOE’s customer service surveys but can also be modified for your agency’s data collection needs.